Arsenal have been dealt a major blow as Arsene Wenger has confirmed Alexandre Lacazette will miss Saturday’s huge showdown against Manchester United after picking up a groin injury. Lacazette once again started for the Gunners up front against Huddersfield Town last night and opened the scoring in the 3rd minute with a fine finish after being sent clear by Aaron Ramsey. However, the French international failed to appear for the second half and Wenger has confirmed the striker suffered a groin injury during the opening forty-five minutes at the Emirates. The Arsenal boss will have to assess the player further before he’ll know the full extent of the injury but Lacazette has already been ruled out of Saturday’s visit of Man Utd and Wenger fears his striker is facing a spell on the sidelines. 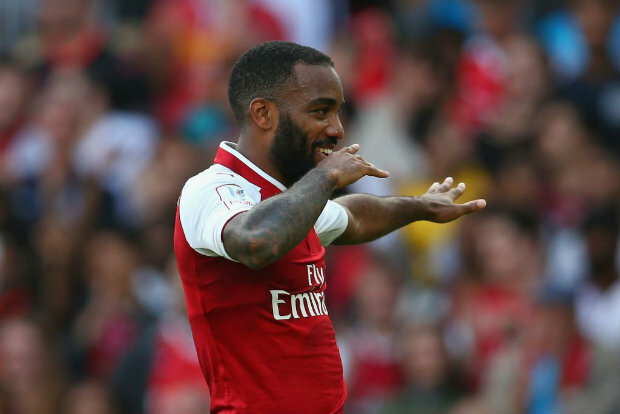 The news will come as a major blow to Arsenal as Lacazette has scored 7 goals in 14 Premier League games this season since joining from Lyon in a club-record £52m in the summer. We’ll have to wait for tests to be carried out before the full diagnosis is given but Wenger must now decide whether to go with Olivier Giroud or Danny Welbeck up front against United. Giroud came off the bench to score twice against Huddersfield last night as Arsenal ran riot at the Emirates to secure a 5-0 win which cements their fourth-placed position in the table. However, they are just four points adrift of United so Wenger will be hoping to reduce that gap with a win this weekend – although the north Londoners will have to do it without their top scorer.